A woman in Brazil has given birth to a "giant baby" weighing 17lb (8kg) - twice the size of an average newborn. Ademilton dos Santos is the heaviest boy ever born in Brazil, says the Brazilian Gynaecological Association. 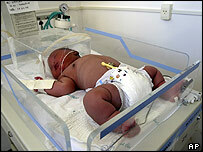 Ademilton was born by Caesarean section on Wednesday at a hospital in Salvador in north-eastern Brazil. He is Francisca Ramos dos Santos' fifth child and doctors said his unusual size was probably due to his mother's diabetes condition. Paediatrician Luiz Sena Azul said Ademilton "could truly be considered a giant baby, for he was born weighing what a six-month-old-baby normally weighs". Mrs Santos, 38, has four other children - aged nine, 12, 14, and 15 - who were all of normal weight when they were born. "She knew Ademilton would be a big baby, but not this big," Ms Leal said. "She, her husband and the hospital staff were caught by surprise." Ademilton is being given glucose solution intravenously, to maintain a safe level of blood sugar, because of his mother's diabetes. He is also receiving oxygen because of breathing problems. But his general state of health is good, according to the hospital director. "Both mother and baby are doing just fine," said Rita Leal, director of the Albert Sabin Maternity Hospital. For Alfredo de Jesus dos Santos, his wife's diabetes was also a problem during previous pregnancies. "Yes, I got very worried," he said. "I got very worried because diabetes is a disease that never gets better." The Guinness Book of World Records says the heaviest baby ever was born to Anna Bates of Canada in 1879. It weighed 23.12lb (10.8kg) and died 11 hours after birth.